Good News for Freedom, Edward Snowden the American whistleblower leaves the transit area of Russia. The words that shook the US on June 9, 2013 when Edward Snowden from a hotel in Hong Kong gave a video interview to Laura Poitras, who made the video public in the interest of society. She published it under the Fair Use Notice Act. This was the beginning of NSA nightmare for the US officials. Now the waters are receding for everyone involved, but not for Edward Snowden, he still face very serious criminals charges if he ever is brought to the US. NSA whistleblower Edward Snowden has been granted temporary asylum in Russia and is allowed to enter the country’s territory. This move would allow him to maneuver and apply for citizenship in another country, so he can hold a passport to take a plane to fly finally to the country that offered him permanent asylum. Good News for Snowden he is allowed to leave the transit area of the airport and finally breath some freedom, at least for now. Knowing the shady political relations of US/Russia we are in the dark as the secret deals these two countries make in behalf of their banking masters. For now all the eyes are in Snowden and that gives him a cloud of security. The US could not attempt a drone strike in Russian territory, it is not in its best interest, this could open up an ego wound on the pride of Russia. One thing is to have diplomatic relations on the light of the camera, but another thing is to allow US to openly brake the sovereign of Russia flying in its skies. The whistleblower has been granted temporary political asylum in Russia, Snowden’s legal representative Anatoly Kucherena said, with his words later confirmed by Russia’s Federal Migration service. “I have just handed over to him papers from the Russian Immigration Service. They are what he needs to leave the transit zone,” he added. Kucherena showed a photocopy of the document to the press. According to it, Snowden is free to stay in Russia until at least July 31, 2014. His asylum status may be extended annually upon request. With his newly-awarded legal status in Russia, Snowden cannot be handed over to the US authorities, even if Washington files an official request. He can now be transported to the United States only if he agrees to go voluntarily. Snowden departed at around 15.30 Moscow time (11.30 GMT), airport sources said. His departure came some 30 minutes before his new refugee status was officially announced. His present location has not been made public nor will it be disclosed, Kucherena said. Snowden eventually intends to talk to the press in Russia, but needs at least one day of privacy, Kucherena said. The whistleblower was unaccompanied when he left the airport in a regular taxi, Kucherena added. However, WikiLeaks contradicted the lawyer, saying the organization’s activist Sarah Harrison accompanied Snowden. FLASH: We can now confirm that Edward Snowden’s welfare has been continuously monitored by WikiLeaks staff since his presence in Hong Kong. Russia is confident that the latest development in the Snowden case will not affect US President Barack Obama’s upcoming visit to Moscow, presidential aide Yuri Ushakov said. “We are aware of the atmosphere being created in the US over Snowden, but we didn’t get any signals [indicating a possible cancellation of the visit] from American authorities,” he told RIA Novosti. Snowden, a former CIA employee and NSA contractor, came to international prominence after leaking several classified documents detailing massive electronic surveillance by the US government and foreign allies who collaborated with them. Snowden was hiding out in a Hong Kong hotel when he first went public in May. Amidst mounting US pressure on both Beijing and local authorities in the former-British colony to hand the whistleblower over for prosecution, Snowden flew to Moscow on June 23. Moscow was initially intended as a temporary stopover on his journey, as Snowden was believed to be headed to Ecuador via Cuba. 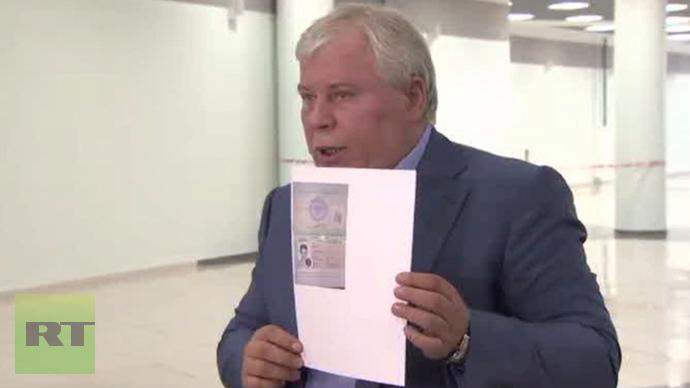 However, he ended up getting stranded at Sheremetyevo Airport after the US government revoked his passport. Snowden could neither leave Russia nor enter it, forcing him to remain in the airport’s transit zone. In July, Snowden applied for temporary asylum in Russia, a status that would allow him to live and work in the country for one year. Kucherena earlier said the fugitive whistleblower is considering securing permanent residency in Russia, where he will attempt to build a life. President Nicolas Maduro said asylum would be “seriously” considered if sought. Snowden deserves a “humanitarian medal,” he added.